The health of Washington’s wildlife today and into the future depends on transboundary coordination with our neighbors. Our analyses to date have shown the importance of maintaining connections between habitats in our states and neighboring states. Our statewide analysis extending into portions of British Columbia, Idaho, Montana, and Oregon helped us to understand these connections. It showed important linkages between Washington and British Columbia across all three species guilds (Montane, Shrub-steppe, and Generalist), and specifically for individual species including badger, mountain goat, lynx, and wolverine. Our climate analysis showed important temperature gradient linkages between Washington and British Columbia as we look at maintaining connections in a changing climate. Our Columbia Plateau ecoregional analysis (a finer scale look at arid lands) extended beyond Washington into Idaho and Oregon, but did not include British Columbia’s arid lands in the Okanogan valley due to challenges with data. As we look to understand the transboundary connections to the north of our state, our Transboundary Subgroup is considering a new approach. Three subregions identified by our workgroup in the transboundary region between Washington and British Columbia. The Transboundary Subgroup worked throughout 2012-2013 to review what we already know about habitat connectivity in the transboundary region between Washington and British Columbia from existing scientific analyses including our own connectivity analyses. A report was prepared in August 2013 summarizing these findings and recommending an initial body of work going forward, Washington Connected Landscapes Project: British Columbia – Washington Transboundary Habitat Connectivity Scoping Report (link downloads a PDF of the full report). Due to the challenges in collecting and analyzing data seamlessly across the international border and the clear patterns that emerged from our analyses to date, we propose taking a different approach to a finer scale analysis in this region than the ecoregional approach. We identified three subregions that would allow us to engage with local experts to look at connectivity patterns and function in portions of the overall transboundary landscape: 1) North Cascades-Coast subregion, 2) Okanagan-Kettles subregion, and 3) Columbia-Selkirk subregion. In 2014, our subgroup prioritized the Okanagan-Kettle subregion for analysis and collaboration. 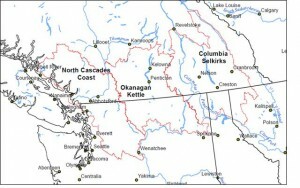 The Okanagan-Kettle subregion straddles the border between the Cascade Range on the west and the Monashee Mountains and Kettle Range to the east. At the northern extent of the shrub-steppe communities of the Columbia Plateau Ecoregion and Great Basin, it is an important area for north–south movement of shrub-steppe habitats and species; and as the central area between two major mountain ranges, it is important for maintaining movement of large carnivores and their prey. A final report was released in March 2016 entitled Providing a Regional Connectivity Perspective to Local Connectivity Conservation Decisions in the British Columbia–Washington Transboundary Region: Okanagan-Kettle Subregion Connectivity Assessment with appendices including data layers that summarizes our key findings for this subregion. Additionally, in close coordination with the Climate Subgroup an intensive effort with partners from Washington and British Columbia was conducted to interpret existing climate connectivity information and analysis for the transboundary region with specific case studies. Read a summary report on this effort that concluded in April 2016, and view the full set of data, reports, and appendices in the project’s Databasin gallery. Funding has been provided for this important cross-border work to date by the Cascadia Partner Forum, North Pacific Landscape Conservation Cooperative, Great Northern Landscape Conservation Cooperatives, Northwest Climate Science Center, and Wilburforce Foundation. Discussion is underway to address the other subregions in the transboundary landscape.